In the previous update, we focused heavily on the work the character team had been doing. We showed the work on the human classes, some of the enemy creatures, armor and weapons. In this update, we are shifting focus over to the environment team. This group has been busy working on the stylised look of each environment type and also on the mechanics of map creation and generation. As always, please remember that everything here is work in progress and is subject to change. As a little bonus this month, and maybe as an early Christmas present, we're going to share with you something new. In the last update, we revealed the New Jericho vehicle. This time, we're delighted to show you The Phoenix Scarab ATV. Development on the Scarab began in 2025 with the objective of providing secure all-terrain transport for crews heading to remote Phoenix bases scattered around the world. The fuel cell powered vehicle would be fully automated with a contained atmosphere capable of accommodating eight personnel for a week without exposure to the outside. Radiation proofing and graphene mesh armour promised amazing levels of protection. The first units were produced in 2027, as Phoenix Command struggled to secure the secrecy and integrity of remaining bases after seizures by state actors in 2023, and the failed organisation wide activation of 2025. Due to the world crisis leading up to World War Three, only a small number were actually produced. In 2032 Scarabs were released to AI control to defend themselves, and as of March 2047 the whereabouts of most of them are still unknown. It still has some work left before it is complete, including some texture work. The render below is what we're heading towards. The vision for the finished vehicle. As part of the human faction design, each faction's buildings have a unique style. The environment team have been focusing on the New Jericho faction over the previous month, so that is mostly what we will be showing here. As New Jericho are a militaristic faction, their buildings generally take on a very fortified "Brutalist" look, with steep, concrete walls and crenellations. Firstly, the concept artists go through several variations of design until a style is settled upon and approved. The next step of the concept process is the "greybox" the design, blocking out the basic shapes without texture or detail. Once the buildings have been blocked out, colour, textures and detail are added to give a better impression of how the finished building should look. A greybox concept which has been overpainted. This is a New Jericho residential building. 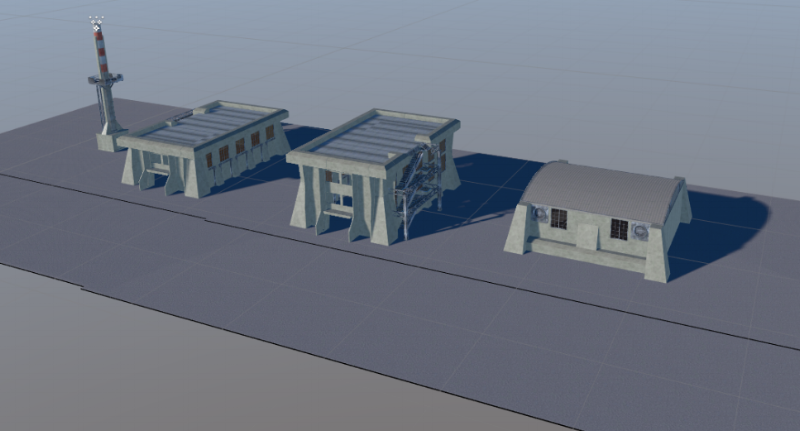 The concepts then pass to the 3D modellers within the environment team to create the basic greybox of the buildings for use in the game engine. The elements of the 3D models are made with smaller, reusable building blocks. These allow new buildings to quickly be assembled, and also divide the buildings up for easier destruction. 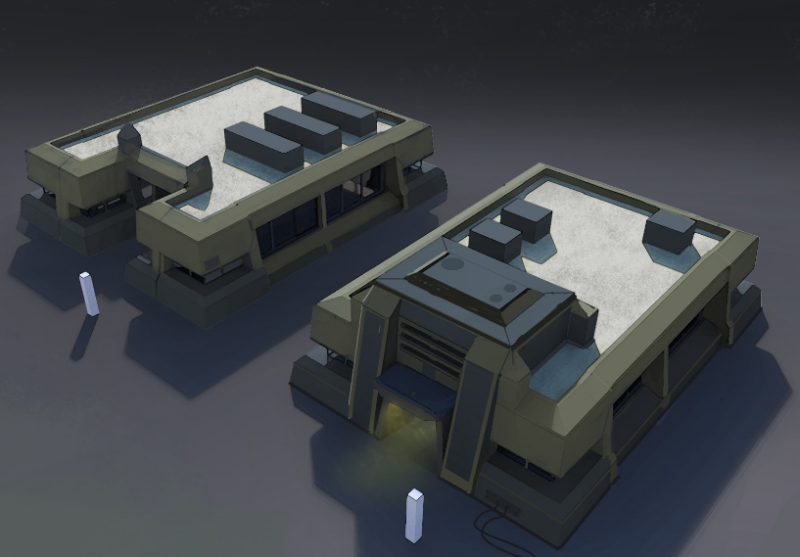 A number of different build variations are made for each type, giving each map a more varied appearance, while still maintaining the style for the faction. A selection of different New Jericho residential buildings. Here are a few different New Jericho factory buildings. While some of the maps within Phoenix Point will be hand-crafted, most will be procedurally generated. What this means, in the simplest terms, is an algorithm takes a selection of premade assets and assembles them based on a set of rules. This gives a different result every time, but helps to ensure that objects and buildings still work correctly. For example; buildings should always be placed so that external doors face a path or road (and of course, to make sure they do actually have external doors!). Buildings with two or more floors should always have at least one staircase, or some other means to access the higher floors. First, we design a number of map layouts. These allow us to set the size of the map, the road and path layout, and the positions for any cover or buildings. The algorithm then places a random variation of the correct building type and of the correct size on each of the pre-allocated building spaces. Buildings can be made up of smaller, modular buildings for even more variation. A residential map with an L shaped road. Another residential area, this time with a different layout. Below is a short video showing how the different building components can be swapped out to produce different maps. As is the case here, building sections can even be placed within or on top of other buildings. To add even more variety, we wrote a script to randomize prop placement. The designers can choose where the props should be placed, and how much space they take, while Tzani's script will automatically place varying props in the chosen spaces. Not only does this script scramble the placement of props, but even the items found on shelving are randomly placed! While much of the recent development focus has been on New Jericho (for reasons which will become apparent early next year), progress is also being made on the other factions. Concept designs are being modelled and textured as we speak. As a little sneak peek, here's a look at a concept for the Disciples of Anu residential buildings. Disciples of Anu residential building concepts. The Snapshot Games team is continuing to expand this month with two new fulltime developers. Please give them a warm welcome. Our first addition to the programming team is Denis. Denis has previously worked programming games for the mobile industry. During his time at NoSixFive he worked on Pop'Em All, Cosmo Run, Project Fox and Jump Drive. He's also made his very own mobile game, Furry, in his free time. Denis is a big fan of RPG games, but his favourite game of all time is Prince of Persia Warrior Within - not a surprise for a self-confessed "time-travel geek". Also joining the programming team this month is Anton. Anton previously worked for Gameloft and worked on titles such as Order and Chaos Duels, March of Empires and Fantasy Town. His favourite game is Fallout. It has been 15 years, and Anton still hasn't been able to find another game that can dethrone it from the top of his list. That's it for this update. The December update will likely come a little early (and be a little shorter) as things wind down over the holiday period. We'll have lots of new and exciting things to show you in the new year, and we can't wait to bring Phoenix Point to our backers and pre-order customers.